County Executive provides support to the County’s Board of Supervisors, to the County’s various organizations, and to the residents and businesses of Santa Clara County. The Office ensures the implementation of legislative mandates and Board policies. It provides analytical support, strategic planning, policy analysis, and budgetary oversight for the County organization. In addition, it seeks to safeguard civil rights, and to educate, inform, and advise both those who administer and those who receive County services. 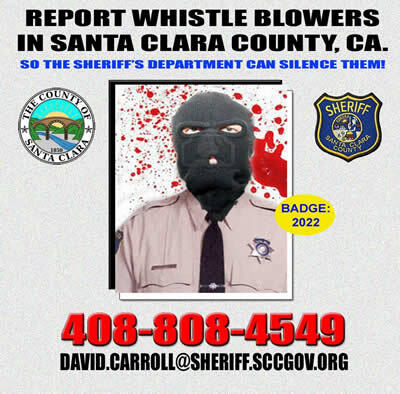 LATEST NEWS ON CORRUPTION IN SANTA CLARA COUNTY CALIFORNIA SAN JOSE: County Counsel Orry Korb exposed for cheating on Whistleblower report and civil rights violation reports. Meet Orry Korb, Counsel for Santa Clara County San Jose California. He was appointed to his high paying and powerful position. He’s responsible for supervising attorneys in General Government, Health and Hospital, Social Justice and Impact teams, as well as the attorneys representing the County Assessor. When informed that judges, lawyers, law firms and housing organizations were illegally taking advantage of the elderly and mentally disabled he failed to act properly. Instead police were informed that those bringing the information to his attention were terrorist and criminals. Statements where twisted, stories turned around and finally the police were used against the public as thugs and abusers. When dishonest government uses Police to harrass, punish and hunt down people who have done the right thing our system is used against us. The reputation of police is further damaged and tax dollars are lost when police are used to silence, extort and stop GOOD PEOPLE who did nothing but inform government about crimes. Santa Clara County California San Jose Judge Peter Socrates Manoukian was found to be involved in sabotaging cases involving senior citizens and the disabled. Similar to now convicted “Kids of Cash” JUDGE Mark Ciavarella Jr. who was accepting bribes and sentencing kids to camps for cash. JUDGE Peter Socrates Manoukian was exposed for doing something similar with the elderly and mentally disabled. Judge Manoukian was sabotaging cases on purpose in favor of big business. The above people have documents, evidence and direct violations of their rights by the named judges and Public Guardian. Even the media got involved and began exposing and documenting the events which affected totally defenseless and vulnerable senior citizens. News ABC 7 Reports with video, this woman is directly involved with the same judges and government officials. What this has to do with POLICE is how they are often used against the public “to serve and protect” WHO? Not the tax payer instead they’re used as thugs to silence good people who come forward with facts and information. IS THIS WHAT POLICE ARE PAID TAX DOLLARS FOR? To harass and stop people from reporting crimes about judges, lawyers and government? Deputy Public Guardian: Arlene Peterson abused her “Power of Attorney” to shut down Heidi Yauman’s HUD complaint to preserve the fraudulent court record created with the help of Judge Socrates Manoukian. is acting like a paid thug to stop justice and protect seniors, the disabled and mentally ill. Imagine an officer of the law who ignores his sworn duty and “To Protect and Serve”. Is this why so much corruption and government abuse has surfaced in Santa Clara County California?